Explore by kayak, Zodiac, and hike with a team of naturalists. 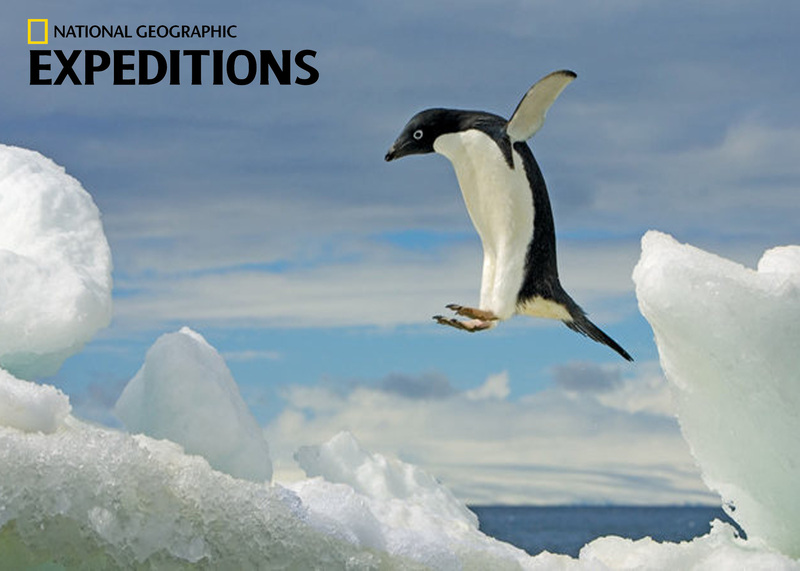 Traveling aboard the state-of-the-art National Geographic Explorer or National Geographic Orion, encounter the spectacular Antarctic Peninsula and the surrounding islands and waterways. Glide around enormous tabular icebergs by Zodiac, walk along beaches covered with thousands of penguins, and kayak amid abundant marine life. View magnificent mountains, towering icebergs, and ice formations that make up the dramatic Antarctic landscape. Cruise aboard sturdy Zodiac landing craft in search of leopard seals. Kayak in protected waters, paddling around icebergs as penguins swim nearby. Walk on shore amid thousands of penguins, including gentoo, Adélie, and chinstrap. Depart on an overnight flight to Buenos Aires (NG Explorer) or Santiago (NG Orion). Settle into the Sofitel Buenos Aires before seeing the city’s Beaux-Arts palaces and the famous balcony associated with Eva Peron. Or settle in to Santiago’s Ritz-Carlton Hotel before our guided overview of this vibrant city backed by the inspiring Andes. Fly to Ushuaia, the southernmost city in the world, and enjoy lunch aboard a catamaran cruise on the scenic Beagle Channel before embarking the National Geographic Explorer or National Geographic Orion. While crossing the spectacular Drake Passage, spot whales and other marine life that glide alongside the ship. With nearly 24 hours of daylight at this time of year, we have ample opportunity to explore the Antarctic Peninsula and the surrounding islands. In keeping with the nature of an expedition, the schedule is flexible, allowing us to take advantage of the unexpected—watching whales perform off the bow, taking an after-dinner Zodiac cruise, or heading out on an extra landing during the day. We anticipate making several Zodiac landings each day to hike, kayak among the icebergs, and experience close encounters with wildlife. This pristine bay is edged by soaring ice-covered peaks. Hike to a summit for a breathtaking view, or kayak along a cliff-side rookery in search of blue-eyed shags. Cruise through the Lemaire Channel between towering snowcaps and blue icebergs. Step ashore at Petermann Island to the cries of thousands of gentoo penguins standing along the shoreline as if awaiting your arrival. Dock in Neko Harbor. Walk among the penguins on the beach or climb high onto an ice field for a panoramic vista of untouched peaks surrounding this idyllic bay. In 1944, the British government began a top-secret expedition code-named Operation Tabarin, creating a series of base stations in Antarctica. Base A, at Port Lockroy, is now a museum and Antarctica’s only public post office. Enjoy the ship’s amenities as the Antarctic coast disappears from view. Round the southernmost tip of South America, and see the meeting of the Atlantic and the Pacific Oceans. Celebrate your voyage at a farewell dinner on board. Disembark in Ushuaia. Fly by charter to Buenos Aires or Santiago and connect with your overnight flight home. For a single room on the Explorer, add $3,990 in Category 2 and $4,110 in Category 3. For a single room on the Orion, add $7,430 in Category 1 and $8,840 in Category 3.
International airfare to/from Buenos Aires and airfare within Argentina is not included in the expedition cost. The group flight between Buenos Aires and Ushuaia begins at $890 (subject to change).